This cart was made for tiles! GymGuard Floor Cover Tiles sit full-size on this large cart, making it easy to transport and set and and take down your carpeted tiles. This cart was made for tiles! 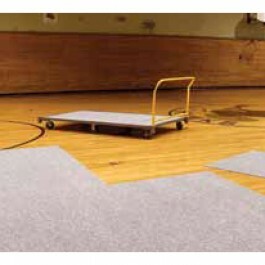 GymGuard Floor Cover Tiles sit full-size on this large cart, making it easy to transport and set and and take down your carpeted tiles. Stack your tiles high and have a mobile storage device.